The Quick-Load 1 kb Extend DNA ladder is a pre-mixed, ready-to-load molecular weight DNA marker containing bromophenol blue dye as a tracking dye. 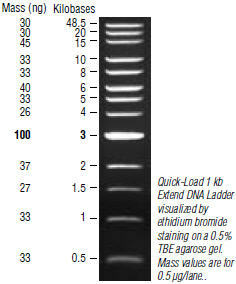 The DNA Ladder consists of proprietary plasmids and DNA molecules which are digested to completion with appropriate restriction enzymes to yield 13 bands suitable for use as molecular weight standards for agarose gel electrophoresis. The digested DNA includes fragments ranging from 0.5 to 48.5 kilobases. The 3 kb fragment has increased intensity to serve as reference band. The double-stranded DNA is digested to completion with appropriate restriction enzymes, phenol extracted and equilibrated in storage buffer. Quick-Load 1 kb Extend DNA Ladder is stable for at least 6 months at 25°C. Store at 4°C. Do not store at -20°C. Usage Recommendation: We recommend loading 10 μl (0.5 μg) of Quick-Load 1 kb Extend DNA Ladder per gel lane. For optimum separation of the highest molecular weight DNA fragments, run on a 0.6% (1X TAE or 1X TBE) agarose gel at 3.5 V/cm (distance between electrodes) for 3 hours. In general, it is recommended to load 1 ul per mm of gel lane. The Quick-Load 1 kb Extend DNA Ladder is not intended for precise quantification of DNA mass but can be used for approximating the mass of DNA in comparably intense samples of similar size. Sambrook, J., Fritsch, E. F. and Maniatis, T. (1989). Cold Spring Harbor: Cold Spring Harbor Laboratory Press.(Ed. ), Molecular Cloning: A Laboratory Manual. pp. 10.51-10.67. QUICK-LOAD® is a registered trademark of New England Biolabs, Inc.
FICOLL® is a registered trademark of GE Healthcare Bio-Sciences AB.